Nachman’s career spanned radio, television and print. He worked in front of the camera and behind; on the street, in the newsroom and in the front office. 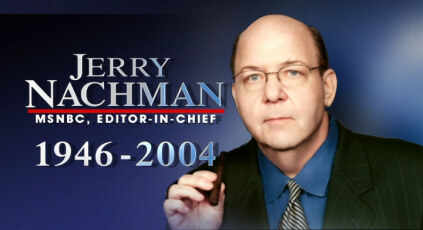 Nachman served as the news director for WNBC-TV in New York City; Vice President, News, WCBS-TV, New York and Editor-in-Chief, New York Post. He also served for many years as an on-air street reporter for both WCBS Radio and WCBS Television in New York, and was a columnist for the New York Post. In separate assignments he was Vice President and General Manager of WRC Radio and WRC Television, both NBC-owned properties in Washington, D.C.
More recently, Nachman was employed as a staff writer on “UC: Undercover,” a primetime drama that aired Sunday nights on NBC in late 2001. Nachman also worked as a staff writer on “Politically Incorrect with Bill Maher,” returning in Election Year 2000 as executive producer. He also co-anchored the nightly public affairs broadcast “Life and Times Tonight” at KCET, the Los Angeles PBS station. In addition, Nachman co-wrote a short film for the American Film Institute that won the 1999 Academy Award in the student competition. His final assignment for MSNBC was reporting on the Michael Jackson case in California. Nachman was the recipient of the prestigious Peabody Award, an Edward R. Murrow Award from the Radio-Television News Directors Association and an Emmy Award, plus numerous others. He served twice as a Pulitzer Prize Juror in the Journalism competition.